Unique range of high-definition games rarely found elsewhere. More than $4,000 available in reload bonuses each week. Hopefully, our Treasure Mile Casino review will convey what a great site this is for high quality entertainment and a fair gaming experience. What might get in the way of us achieving our goal is the multitude of restrictions on jurisdictions and bonuses, and the convoluted withdrawal process which, although in place to protect players from fraud, could easily be made much simpler. We feel it is important for players to be aware of these facts. So, rather than publish a Treasure Mile Casino review in which we gloss over potential negatives, we prefer to give players reasonable expectations. However, as we cannot cover every possible permutation of restriction within the review, we strongly recommend you read the site´s terms and conditions before creating your account. One of the benefits of playing at a casino using web-optimized technology is you can play the games anywhere. Treasure Mile provides a rich selection of high definition casino games that can be played on a PC or mobile without having to download software or install apps. You can also create and fund your account from anywhere, request a withdrawal or contact Customer Support. The Treasure Mile online casino has been providing a dynamic casino experience for players since 2009. Operated by the well-regarded and trusted Genesys Technology Group, the casino has developed a reputation for fair play and customer satisfaction – mostly due to the site´s transparency in its terms and conditions which go to great lengths to explain the restrictions in full. The software responsible for the dynamic casino experience is provided by Saucify and independently tested for fairness by iTech labs. Each game flows seamlessly as you play it and you have the opportunity of testing each game out with play money before investing any of your own (requires you to log out of your account and log in again in “Practice Mode”). The Welcome Offer for new players is a relatively modest 100% match on your first deposit up to $500 or currency equivalent (*) with a 40x clearing requirement, plus a further $25 free – with no clearing requirements – on your second deposit. To take advantage of these opportunities you have to click on the bonus tab and enter the Treasure Mile Casino bonus code “SHOWTIME” within five minutes of making your first deposit. The bonus code to use in order to claim the $25 free cash is “TREASURE”. As well as being relatively modest, the bonus element of the Welcome Offer is limited to slots and specialty games. In fact, any action on video poker or table games will not contribute to clearing your first three bonuses; and – if you live in certain jurisdictions – you will not be allowed to play video poker or table games at all (which is a shame because the video poker games are particularly good). (*) Please see our “Important Notes about Deposits and Withdrawals” below. Although the Welcome Offer may be modest when compared to some other online casino bonuses, the volume of reload bonus opportunities is massive. There is more than $4,000 up for grabs each week in daily reload bonuses, plus additional promotion bonuses and bonuses promoted to players via email and social media. The site also offers no deposit bonuses on players´ birthdays and on the anniversary of their registrations. The range is incredible and often accompanied by “free spins” offers. Unless otherwise stated, the reload and no deposit casino bonuses also have a 40x rollover – the number of times you have to play through the bonus funds before you can withdraw your winnings – and, once you have cleared your third slots-and-specialty-games-exclusive bonus, you can take advantage of some very generous wagering contributions for Roulette (50%), Three Card Poker (50%) and Baccarat (25%). The wagering contributions for Video Poker (10%) and Blackjack (5%) are still relatively mean. What really sets Treasure Mile Casino apart from many of its competitors is the unique range of HD games. The number of games is much the same as any other online casino, but the quality of the games – particularly the video slots and video poker games – is amazing. As mentioned above, gameplay is seamless and, despite the wide selection to choose from, there are no issues with navigating the site. In addition to more than sixty video slots, there are plenty of classic slot games to choose from. The video poker games range from single line games to fifty line games, and the selection of table games includes European Roulette, Single Deck Blackjack and Punto Banco – all of which only have a small house edge. There are also four Keno games and two scratch card games. 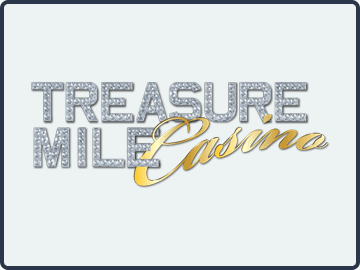 Treasure Mile Casino offers a wide range of fee-free deposit and withdrawal options, some of which are country-specific. Importantly, if you live in a country whose currency is supported by the cashier (i.e. one of EUR, CAD, SEK, NOK, DKK or GBP), you have to fund your account with that currency. Players living outside of Europe and Canada can fund their accounts in US$ or Bitcoin. When you request your first withdrawal, you have to complete a withdrawal request form that is emailed to you, supply the usual identity verification documents and undergo a telephone verification process. There is a minimum withdrawal limit of $100 and, if you are unable to take advantage of the fee-free withdrawal options, there is a small charge to have a check posted or couriered to you. Great mobile-friendly software that doesn´t drain all your device´s resources. Non-stop flow of promotions and bonuses – be sure to read the terms of each! Free cashouts to most funding sources, and low cost alternatives available. No table games for first three bonuses. Withdrawal timetable is hard to follow. Wagering limits apply to bonus funds. We started our Treasure Mile casino review by stating it is a good site with a load of restrictions. In the site´s defense, it doesn´t try to hide the restrictions and – if you are in any doubt about how they may apply to you – there is excellent Support available around the clock. Other than the restrictions, there is plenty to like about Treasure Mile casino, particularly if you have never experienced Saucify software before. We thoroughly recommend Treasure Mile Casino to players with a modest bankroll looking for an enjoyable and potentially profitable casino experience. The site is well-established, is proven to be fair, and has developed a reputation for customer satisfaction. There is a great range of games and a massive amount of reload bonuses available. Just be sure to read the terms and conditions – and make sure you understand them – before playing at the site. Visit Treasure Mile Casino Now!